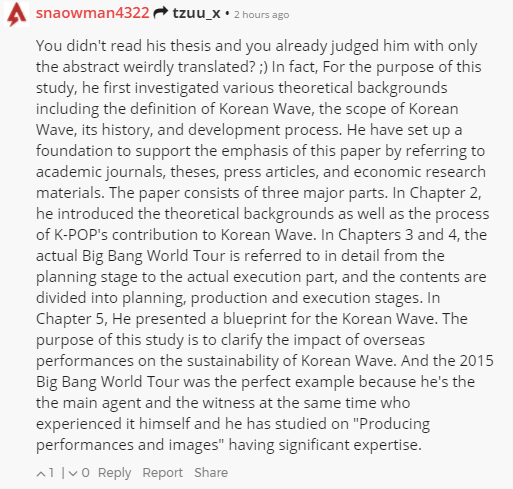 This thesis is a report of the 2015 World Tour [MADE] by Korea’s representative boy group BIGBANG, taking the world as their stage and standing at the vanguard of the Korean Wave. Based on this I make my discourse on the Korean Wave. The commonly acknowledged term “Tour Concert” refers to a concert type that travels to various regions with a single performance format. Tour Concerts by Korean artists that had just been nationwide in the past are now expanding their range worldwide. However, the demand across the nation or the world is vital. There is no significance in establishing Tour Concerts without public demand, and Tour Concerts cannot be created in the first place. In this regard, BIGBANG has received endless love calls from 21 countries worldwide, thereby obtaining justifiability to hold a large-scale world tour concert in 2012 and once again in 2015. Many fans seem to show support for our music and performance through the direct communication that we have with them at overseas performances. This is because the limitations of the indirect exchange that occurs online through the Internet cannot surpass direct communication. The synergy between a world-class creative team and BIGBANG’s impeccable live performance, always presenting a perfect tune for the worldwide music market trend, together with elaborate laser lighting and stage equipment marked another epoch in popular arts, a real experience for fans around the world who had been waiting for BIGBANG’s performances. As a member of BIGBANG, it is always overwhelming to present our music to the world stage. To those that listen to our music in various local regions, each and every song will become an important parameter for determining the overall awareness of K-Pop contents. Therefore BIGBANG and other Korean artists should take high quality contents to communicate with K-Pop fans in foreign countries and aspire for a far reaching expansion of the international demand of our Korean popular arts contents. He deserves that self praise. Lol….and it isn’t anything that others haven’t said already. Didn’t he do it WHILE on tour too?? Wow! Writing a thesis is an enormous amount of work and sacrifice on its own, and with everything they had going on during 2015, I find it really amazing he could accomplish it, certainly it was not an easy feat. Congrats Youngbae!!! Once again proving to all of us your incredible work ethic. Here I am thinking my 20 page thesis was tiring. Yeah I know what you mean… I wrote a 50+ page thesis for my Masters in Education and then I wrote a 60+ page portfolio for my teaching certification (all in the same year…LOL! )… then the 3 major exam to prove I knew how to teaching…UGH…. But at least I could spread those out over a year of schooling… Taeyang had to put it all in one shot… GO TAEYANG! I’ve gone through master’s thesis stress twice. One was my sister’s and the other one my own. My master’s thesis took me numerous nights without sleep, some skipped meals, working and revising data on work breaks, and a very much appreciated weight loss. And I totally understand your point, if you don not like your master’s you’d hate yourself for that much sacrifice for something that didn’t fulfill you. I have no words to express how proud i’m about BB members! !They’re all precious, i bless the day i discovered them!! PS: what happened to TOP’s master’s? Has he finished it yet? You’re not alone. This is the first time I hear about it. First off, I’m mad I’m just learning of this when he apparently accomplished this in February 2016. Second, Dong Youngbae out here putting on tours while writing a thesis and I can’t even write my blog for a month. I’m questioning my life choices right now. I’m mama bear proud of our Sun. It’s amazing how he could accomplish this in the middle of so many things back in 2015!!! I would never imagine some day we could add this title to the already huge list to describe Dong Youngbae… he really is a role model, seriously, what a man!! I’m just… speechless!! wow Young Bae! Dope Master’s! what’s next? GD master’s in music production??? Seungri, Master’s in Business Expansion??? Dae, Master’s in variety show-manship??? Top, Master’s in film production??? These guys are really awesome!!! I’ll not be surprised if we can hear some PhD’s coming from these guys. He truly surprises us with hidden accomplishments. I have always said he is so well spoken and his thoughts are so thought-out and precise when spoken. First he did a theoretical study of the Korean wave, tracking its evolution from its origin in mid-1999. He divided the Korean Wave into three stages: Korean Wave 1.0 rooted in drama and film; Korean Wave 2.0 which began in the mid-2000s centred in Japan; and Korean Wave 3.0 which refers to the period since 2010 with its emphasis on Korean culture and lifestyle, or K-culture. He alluded to the spread of the Korean Wave at each stage with reference to the propagation, popularity and export growth rate of certain goods and brands in different regions of the world. He noted the limitations of quantifying the popularity of Kpop, and analysed Google keyword search trends from 2005-2015, in particular “Kpop” and “Bigbang” to compare their search frequency over the years. He studied the market response to their 2012 tour and compared it with 2015 and why they did the Made tour as it is, with specific details on the concert planning background, tour publicity, release of new music resulting in new performances at certain countries, stage preparations for almost every song at every stage in every country, stage devices and architecture, sensory adaptation to stage space, special effects, lighting, accidents that happened and what didn’t work – all these to emphasise his point about concert production and its impact on concert experience for the audience. He noted the importance of relying on local production companies at each country they went to in understanding and catering to local behaviour, how sites like Tencent and DramaFever provided video streaming access for countries around the world, all as part of promoting their music and the Korean Wave. He picked up these minor details which I didn’t expect of him as a singer, since there are company staff who deal with these things. Then he talked about the future of the Korean Wave, the flaws in the Kpop industry and why overseas concerts continue to be important looking at world music market consumption trends. I would like to add that his dissertation was confirmed by a panel (it says so on page 3 of his paper) and I felt he really put in a lot of effort to research and structure his paper. Wow, it’s like the MADE tour is actually the “experimentation and data gathering” part or Young Bae’s Thesis. Awesome!!! After troll Bae, we see scholar Bae!!!! I like the part about a world tour not being possible without real measurable demand. Demand after BB is real.